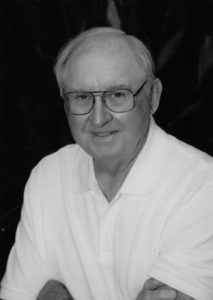 Roy Craven McDonald “Big Mac” of Grays Prairie, TX passed away on September 16, 2018 at the age of 82. He was born in Grays Prairie, TX to John Roy McDonald and Nora Edith Marie Craven McDonald. Roy was preceded in death by his 3 brothers, Wayne McDonald and his wife Janelle, Glenn McDonald and his wife Jackie and Jerry McDonald. He is survived by his wife of 60 years, Beth Woods McDonald; 2 daughters, Monnette Gray and her husband Jeb, Melaine Woolsey; sister-in law, Carolyn McDonald; grandchildren, Steven Guajardo, Eric Woolsey, Collin Woolsey and Peyton Woolsey and numerous nieces and nephews. Roy played basketball at Kaufman High School and Lamar University. Roy just renewed his 2018-2019 season tickets for UT Basketball. He has been a ticket holder for 52 years, Hook-em! After graduating from Kaufman High School, Kaufman, Texas he joined the US Army as a Private First Class in the Korean War. He later graduated from Lamar State University in Beaumont, Texas with a BBS in Accounting. Roy retired to his beloved ranch in Caldwell County in 1991. He did not retire though, he just took up another job, ranching. Visitation will be held at McCurdy Funeral Home in Lockhart, TX on Friday, September 21, 2018 from 5:30 pm to 7 pm. A Memorial Service will begin at 7pm. Graveside services will be Saturday, September 22, 2018 at 1 pm at the 1857 Historical Woods Family Cemetery located on Woods Cemetery Road in Yorktown, Texas. Military Honors will be rendered. Pallbearers will be Steven Guajardo, Eric Woolsey, Collin Woolsey, Jeb Gray, Scott McDonald and Kenneth Derrough. Arrangements are under the care and guidance of McCurdy Funeral Home, 105 E Pecan St.